In a world saturated and obsessed with fashion, GLAUDI couture and wedding designer Johana Hernandez seems to consistently find a way for her creativity to stand out. What started as a women’s couture line for the sophisticated and elegant has also evolved into the creation of a custom bridal line for women of all shapes, sizes and cultures. Beyond the daily hustle of running a business, she finds time to give back to causes that are close to her heart. This month Johana partners with the Jenni Rivera Love Foundation led by Rosie Rivera, to raise funds for the non-profit dedicated to helping women and children who have suffered from domestic violence and abuse. Their goals are to help single women get back on their feet, to overcome their battles of poverty and abuse and to ensure that women and their children have access to safe shelter and supportive services including housing, job training and counseling. 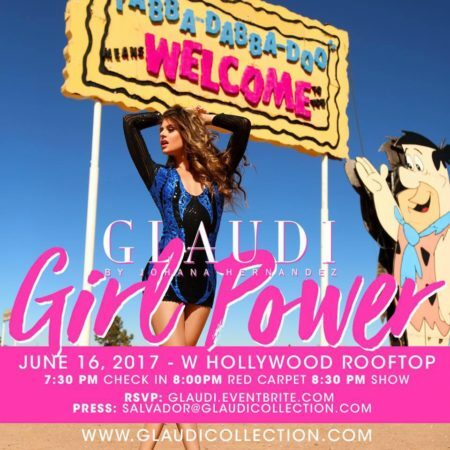 The #GirlPower event will be a summer roof top party and fashion show to take place atop the iconic W Hotel Hollywood and will feature the #2017 #GirlPower GLAUDI Collection designed to bring awareness to the redefinition of women empowerment. A portion of the ticket sales will benefit The Jenni Rivera Love Foundation. Featuring a media attended red carpet along with celebrity guests, this fashion show experience will showcase designs loved by Hollywood stars such as Nicole Richie, Gina Rodriguez, Lucero, Gloria Trevi, Alejandra Espinoza, Aislinn Derbez and many more. When catching up with Johana at her GLAUDI store front last week located in Downey CA, it dawned on me: more than ever we are living in a time where individually we have the power to launch our dreams while collectively we have the power to realize them. I was touched by the vibe of her hard work, determination and faith. Johana shared her inspiration to become a fashion designer stems mostly from her parents and grandmother. Her family worked in the dress makers industry as they called it, and she grew up around sweatshops seeing her parents work long hours and awed by how much they enjoyed sewing. It was as though Johana knew from a young age that her destiny lie in fashion. “I didn’t get to meet my grandmother but my mom tells me all about how much she enjoyed making dresses for all woman”, says Johana who has been working as a designer since the young age of 18. I wasn’t surprised when “God” was her answer to my question about her passions. If you’ve ever seen Johana and her GLAUDI models you’d have mostly likely seen them wearing her “GOD IS FABULOUS” fitted t-shirts, and everyday reminder of her belief that every woman has god given talents and the ability to be influential in other peoples lives. As I made my way through GLAUDI’s boutique styled location I couldn’t help but feel the love that goes into each dress and quickly envisioned myself in one of Johana’s sparkly and classy modern Cinderella dresses. “When it comes to the #GirlPower my goal is to use fashion as a way to empower women whose self-esteem has dropped due to domestic violence and poverty”, Johana told me. When hearing that Rosie Rivera suffered from sexual abuse and domestic violence herself, Johana became impressed at how strong and resilient a woman becomes through it all. Not giving up on love and still believing in good people was something she said Rosie realized after seeking the support she needed to overcome her heartbreaking situation! The Jenni Love Foundation, in memory and tribute to the resilient spirit of her sister the late Jenni Rivera, reminds us that no obstacle is too big to overcome especially when we come together in #GirlPower.